Burnout has a long tradition of studies in the workplace and recently researchers suggested burnout is also rising among university students. 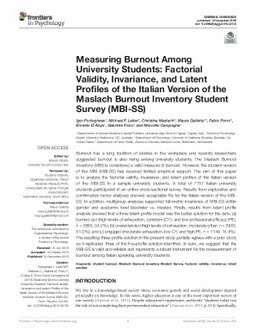 The Maslach Burnout Inventory (MBI) is considered a valid measure of burnout. However, the student version of the MBI (MBI-SS) has received limited empirical support. The aim of this paper is to analyze the factorial validity, invariance, and latent profiles of the Italian version of the MBI-SS in a sample university students. A total of 7757 Italian university students participated in an online cross-sectional survey. Results from explorative and confirmatory factor analyses showed acceptable fits for the Italian version of the MBI-SS. In addition, multigroup analyses supported full-metric invariance of MBI-SS within gender and academic level (bachelor vs. master). Finally, results from latent profile analysis showed that a three latent profile model was the better solution for the data: (a) burned-out (high levels of exhaustion, cynicism (CY), and low professional efficacy (PE); n = 2665, 34.2%); (b) overextended (high levels of exhaustion, moderate other, n = 3953, 51.0%); and (c) engaged (moderate exhaustion, low CY, and high PE, n = 1149, 14.8%). The resulting three-profile solution in the present study partially agrees with a prior study as it replicated three of the five-profile solution identified. In sum, we suggest that the MBI-SS is valid and reliable and represents a robust instrument for the measurement of burnout among Italian speaking university students.